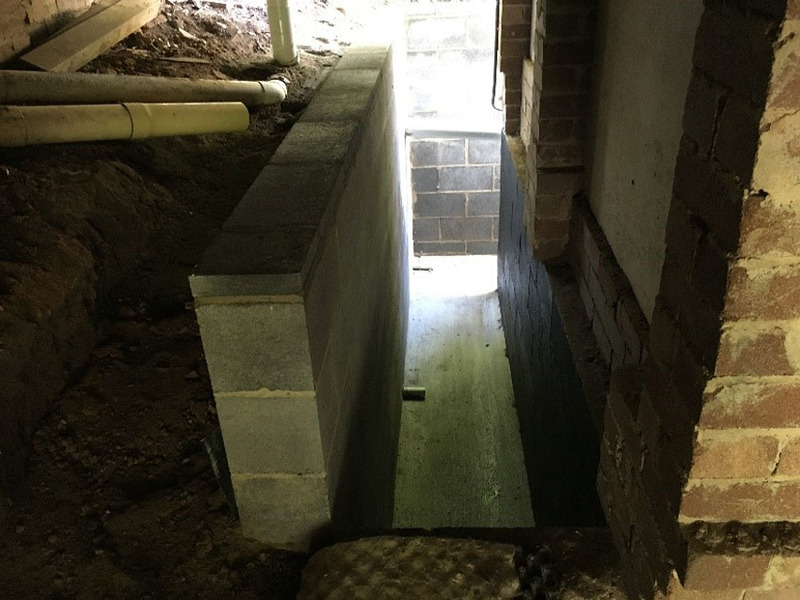 Retaining walls are one of the most effective methods for blocking out damp soils/ moisture, and diverting sub-surface water flow away from houses, into proper storm water inlets. If your house or landscape is a victim of dampness or water damage, consider the benefits of a physical barrier (i.e. 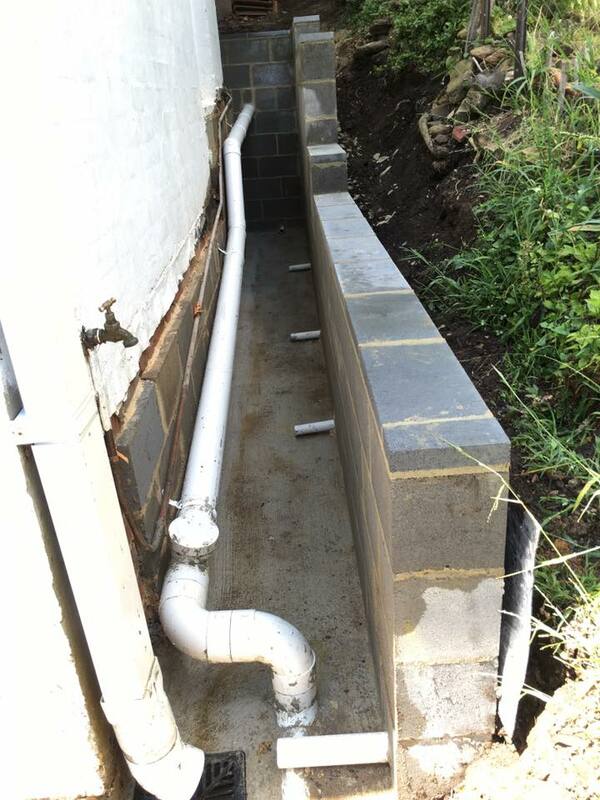 waterproofed retaining wall). Retaining Wall Constructions are specialists when it comes to wet sloping blocks and rocky embankments. 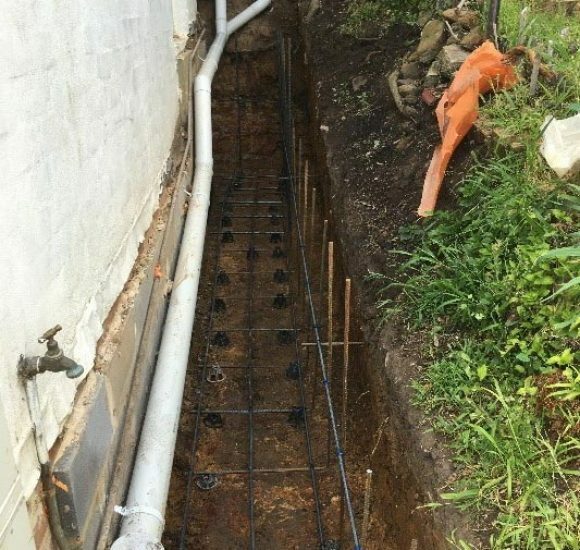 We design and install our impermeable walls to protect houses and divert water flow to areas in which a plumber can readily connect into PVC pipes. Types of barrier walls are often specially formulated shotcrete retaining walls or concrete block walls. RWC only use proven waterproofing products from reputable brands such as Drizoro ™. When it comes to dealing with water, there is no room for error, so contact us for a free site evaluation today! Do you have a sloping block like this one in Avalon? As you can see, the damp soil is pressed right up against the house and moisture is seeping into the bedroom inside, making it mouldy with damp musky smells. 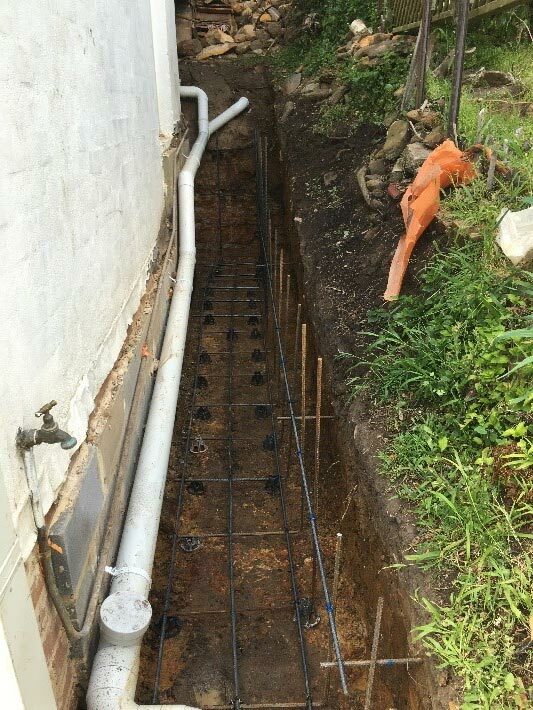 The saturated soil is dug away below the house level, the house walls are cleaned and waterproofed using Drizoro ™, the drainage pipes are re-routed by our plumber, and the steel reinforcement is put into place by the RWC team, ready to pour watertight concrete footing to seal away the ground moisture. The concrete footing forms a dish drain to keep water away from the house. 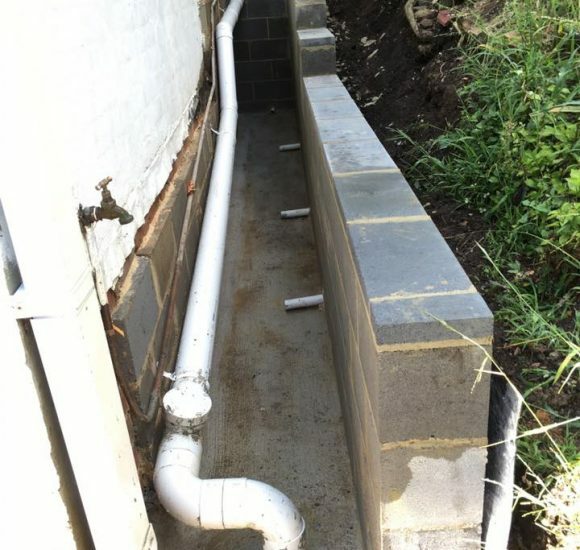 The new retaining wall blocks out any moisture from the soil, and diverts it into the drain to be carried away by the stormwater pipes put in by our plumber. 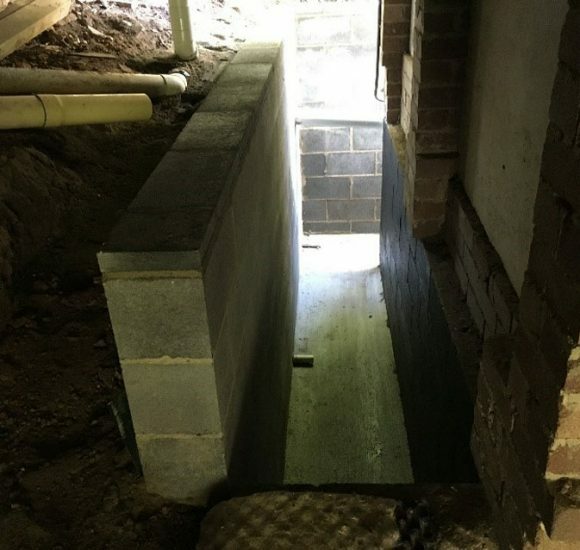 There are many ‘quick fix’ solutions for drainage, but this is the only foolproof way. Each step is methodically carried out by the RWC team. 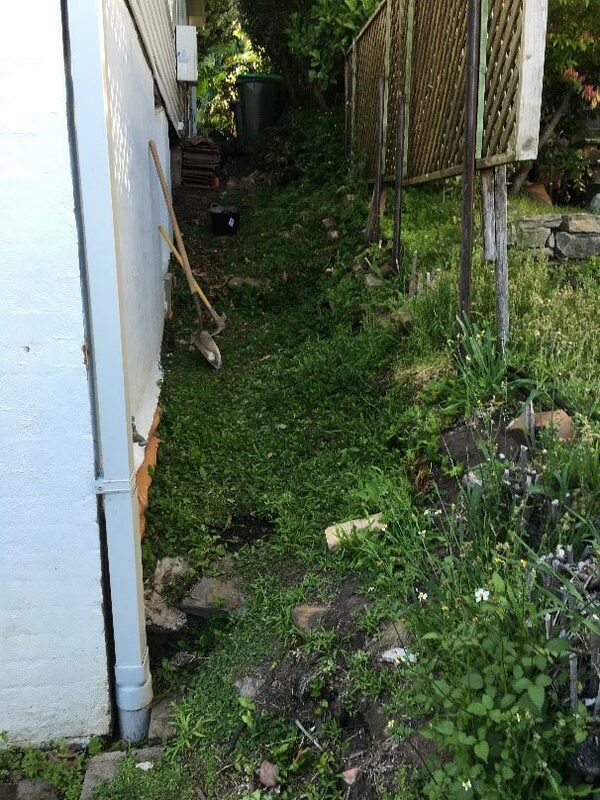 The damp soil used to rest against the house (right hand side of photo). 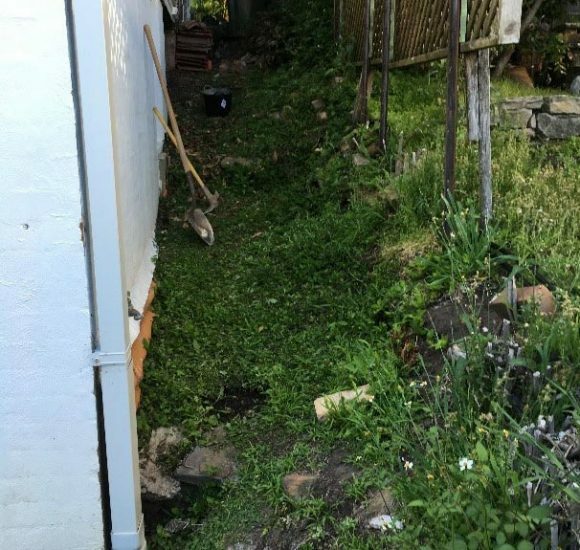 RWC dug out the area, built a structural wall (left hand side of photo) to provide an air gap between the house and the soil. The house wall was also waterproofed. This way, we are 100% sure no moisture can reach the house walls again.